Tonight’s gig was one I did not want to miss – not only are King King a great live band, but this tour is the final one with the band’s original bass player, Lindsay Coulson who has sadly decided to step down as the band’s growing popularity demands being away from home more and more, so this would be my last chance to see him perform with them. 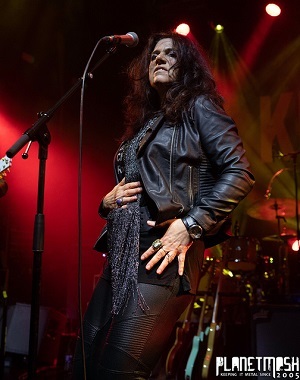 Added to King King being a great band, they’ve brought along a superb support act on this tour – Sari Schorr. She’s a fantastic blues/blues-rock singer with a powerful voice, a real rock attitude and a great band behind her which includes Ash Wilson on guitar for this tour. Unsurprisingly her set tonight is mainly taken from her current album, Never say never – it’s a fantastic album so I was pleased to hear the songs performed live. We also get a cover version – Mott the Hoople’s “Ready for love” (also a well known cover by Bad Company) where unsurprisingly she does an excellent job. It’s one of those gigs where the support act’s performance leaves you wondering how the headliner can possibly beat it. Sari Schorr really is a great singer and it’s an excellent start to the night. Then it was time for King King. They’re an incredibly hard working band that tours almost non-stop and whenever you see them play live that experience shines through as they always put in an almost flawless performance (the only slip tonight being when Alan Nimmo instroduced a song only to have Lindsay point out that there’s supposed to be a different song before that one). A minor slip but I guess that’s what happens when you don’t print the setlist out. A nice touch during the set was when they dedicated “Coming home (rest your eyes)” to Ted McKenna, the drummer with Sensational Alex Harvey Band who died a few weeks previously. It really is a great performance from the band – they’ve got a strogn catalogue of great catchy songs, and perform them beautifully – there’s never any showing off, it’s just a well oiled machine working together in perfect harmony. It’s a performance that goes down very well with the crowd – there’s very little in the way of people having conversations at the back which you often get at this venue, instead everyone is listening intently to the band – if only every gig could be like that!! 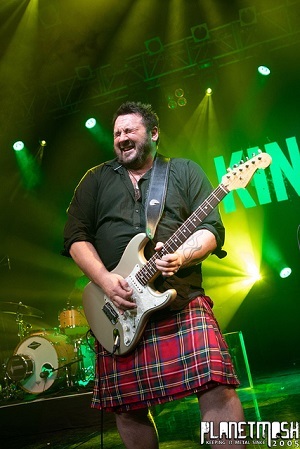 It’s another great show from King King, and while it’s sad to see Linday go, I’m sure they’ll have a great replacement arranged and will continue to go from strength to strength as a band.